Come join us in the latest Dream Valley challenge, our sponsor is Cute as a button. I recently bought a coffee stain stencil and felt that this worked with the image. I think in this case it might be whiskey rings after a hard night gambling! I should hasten to add I’ve never done that, but I can imagine lol. I added the cards to the card as I felt it might look like one of the hands the gamblers in my imagination might have had. I hope you are able to buy into my imagery! #176 Dream Valley challenge – Dry embossing. 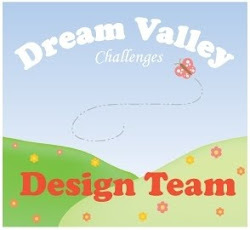 Our sponsor for this challenge is Cute as a button stamps, come over and join us in the Dream Valley challenge . For this first card I printed out the girl with the sack of buttons. I decided I wanted her to have orangey brown hair and the colouring took shape from there. The background was one I’d made a few weekends ago when I had some spritzer bottles and inks. I cut the background to fit onto this card and dry embossed a chevron pattern onto it. I used some of the same sheet to add a sentiment to the tab which said happy birthday and embossed that too. I love the pastel colours. For this second card I chose to use a turquoise theme and coloured the image in various tones of two chameleon pens. I chose a colour to suit this and dry embossed a background then wiped a white ink pad over the top of the embossing. The sentiment from Crafters Companion flutterby collection was then stamped onto the same colour card stock and layered up with some flowers gems and ribbon. To finished I added the fairy dust falling from her hand with some iridescent stickles.